PC Dean Morrison's body was found in a burn at Carnoustie. The funeral of PC Dean Morrison was held at Carnoustie Church three weeks after he died on his way home from a Christmas night out with colleagues. 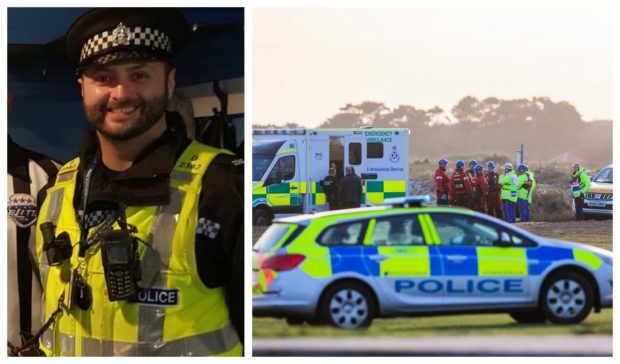 PC Morrison’s body was discovered in the Barry Burn, beside the Angus town’s famous championship golf course, on Sunday December 16. Police said the 40-year-old’s death was a “tragic accident”. The flag at Police Scotland Tayside Division’s HQ in Dundee was flown at half mast today as a mark of respect. Dozens of friends and fellow officers attended the service in Carnoustie this afternoon. Welsh-born Dean is survived by wife Emily, 41, and his ten-year-old son. His wife and senior officers paid tribute to PC Morrison, who served Tayside Police and the amalgamated national force for a total of 16 years, latterly at the Longhaugh police office in Dundee. Emily said: “I would like on behalf of Dean’s family, to take this opportunity to thank our friends and Dean’s ‘Police family’ for their support and kindness during this very difficult time. “I would particularly like to thank those of you have taken the time to post so many kind comments on Social media platforms which have given us insight into the character of the Police Officer we all knew, loved and have now lost. Divisional Commander Chief Superintendent Andrew Todd said: “Today the police family unites to bid farewell to a well-liked and hard-working officer. And Deputy Chief Constable Fiona Taylor added: “Police Scotland was fortunate to have had PC Morrison during his 16 years of service.